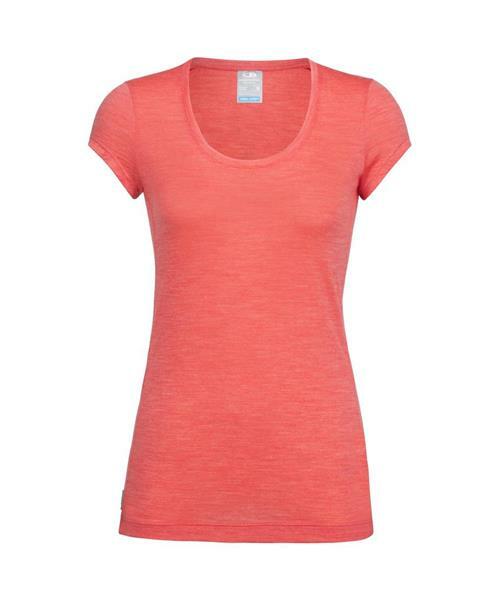 A modern daily merino wool T-shirt that packs as much flattering style as it does soft comfort, the Sphere Short Sleeve Scoop is a summertime wardrobe staple. Icebreaker's Cool-Lite™ jersey fabric blends natural Tencel® with their corespun fibers—nylon threads wrapped in merino wool for the ultimate combination of softness, breathability and durability. The deep feminine scoop neck, cap-sleeve construction and offset shoulder seams provide total warm-weather comfort with a versatile look. Sphere SS Scoop - Womens is rated 4.4 out of 5 by 13. Rated 2 out of 5 by Laurajane021 from Didn't like the fit I ended up returning this shirt despite loving the black heather colour! I found the top of the shirt to fit well, but the bottom was too loose for my liking. Sizing down would have made the top of the shirt too small. If you are looking for a looser fit around the tummy, then you may like it. I wish they made other shirts in this colour. Rated 5 out of 5 by Jerilyn from Great value for a wardrobe staple This tee is so soft and lightweight and the dew colour is gorgeous. The fit is slightly loose but flattering. Wore for 2 days in a row with zero odour. I bought a medium for a looser fit but a small probably would have been fine too. I’m 5’4” and 135 lbs with a larger chest. Rated 5 out of 5 by Retiredteacher from Versatile Shirt I love this shirt! The black heathered color is fantastic as it can be dressed up or down. It's cool enough to wear in summer and can be layered under a cardigan in cooler temperatures. It's a great shirt for travel as it can be washed in the sink and dried overnight. Rated 5 out of 5 by Marie87156999 from Cool blues Love this shirt! Flattering fit and can easily transition from a technical top to a casual piece. The fit is slightly loose but is well-suited to the style and cut of the shirt. Rated 5 out of 5 by BellaCiclista from great for travel I bought this mostly for a recent vacation and the 14-hour flights it took to get there and back. It was comfortable, stylish, didn't stink, and looked good with both my pants and skirt. It was also easy to wash and dried quickly. I also liked the fit which was not too tight and not too loose. Rated 4 out of 5 by Jojos from Good t-shirt I got this t-shirt in grey in Large. It is long, which i like, but fits a bit loose. I would have liked more fitted. Great material, great shirt for working out or running. I even wear it sometimes to work under a jacket. I really like Icebreakder products, all good quality. Rated 5 out of 5 by Coastalhiker from Soft and breathable Great shirt. Bought as a gift and she loves it! Soft fabric and stays dry. Good for hiking and also just for wearing on a daily basis, because of the comfort. The colour was a little bit deeper than it appeared to be in the picture, which she preferred. Rated 5 out of 5 by Meldago from Haven't tried it yet I received rave reviews from my friends so I purchased items for my daughter for her humanitarian trip to Colombia. The product is really light weight and is supposed to be easy to wash and dry. She's looking forward to using it!